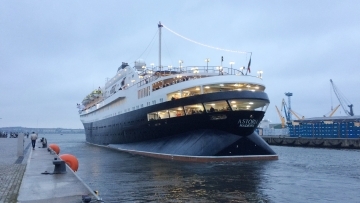 MS Astoria, operated by Cruise & Maritime Voyages (CMV), visited the Hanseatic city on April 14th as the first of 12 cruise ships. Like all other calls of cruise ships, this maiden call was handled by our Sartori & Berger port agents in Rostock. 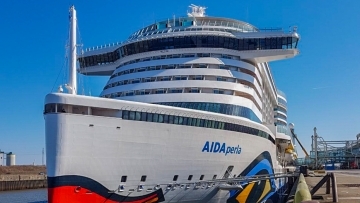 On Sunday, AIDAcara opened the AIDA season 2018 in Kiel in perfect weather. We are looking forward to handling 62 calls this year with five AIDA ships in ground handling as well as in port agency. 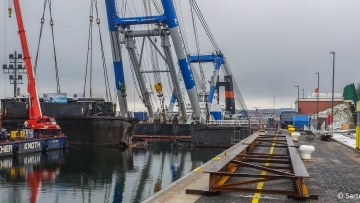 The repair of the Kiel-Holtenau lock goes full speed: The two parts of the lock gate were recovered with the help of floating crane Matador 3 of Bonn & Mees. The crane came from Rotterdam and was handled by Sartori & Berger during the Kiel-Canal passage. 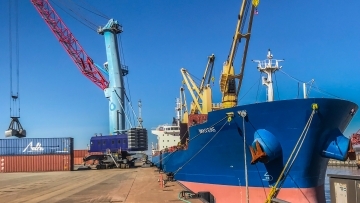 Our stevedoring was involved in mooring and unmooring. Variety is the spice of life: Recently Imavere moored at BUSS terminal in the port of Stade to discharge cement clinkers. Sartori & Berger was in charge of the port call and smooth handling as well as responsible for customs formalities of the cargo. 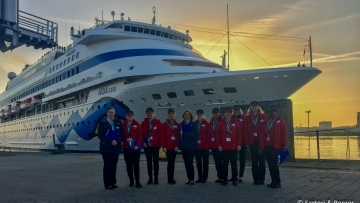 Despite the storm and various stoppages for navigation on the River Elbe the team of Sartori & Berger welcomed the newest member of the AIDA fleet on Saturday afternoon. This morning at 5 am the CMA CGM ANTOINE DE SAINT EXUPERY moored at Burchardkai in the port of Hamburg. It is the first time that the container ship is in the Hanseatic City and with 400 mtrs. length, 59 mtrs. width and a deadweight capacity of 199,855 tons the largest visitor of the port at all. For our port agents this is a very special port clearance with a breathtaking view of the freighter, which holds up to 20,776 TEU containers. 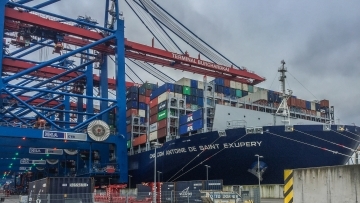 After the wind was decreasing, the closure of the river Elbe was lifted, thus enabling CMA CGM Kerguelen to moor in the port of Hamburg on Saturday morning. One of our port agents was on standby all the time, ready to go aboard the container ship for clearance at any time. 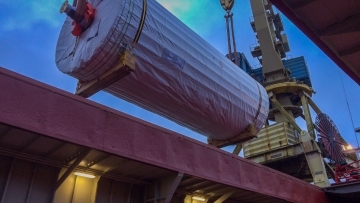 On Wednesday the MV Saturn moored in Rostock to take onboard an 85-t-dryer for agricultural products. 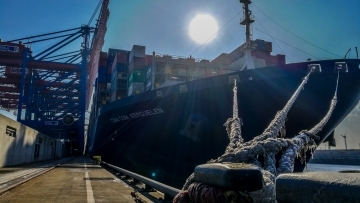 The call of the cargo ship was handled by Sartori & Berger: the port agents took care of registration, ships clearance and customs formalities. After a successful loading the MV Saturn left for Klaipeda. 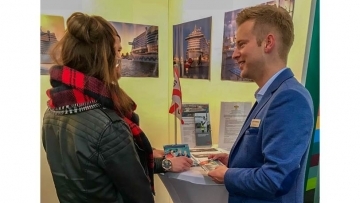 At the Cruise Center Altona the 6th Hamburg Job Fair took place on Saturday with approx. 6.000 visitors. Timo Kaden presented various fields of activity of Sartori & Berger. In the focus were numerous part-time jobs in the cruise sector as the season already starts in 4 weeks. 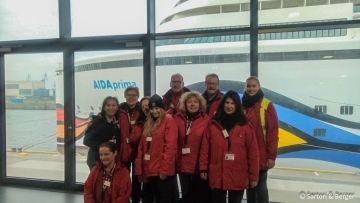 At the weekend, after a total of 85 calls since 2016 AIDAprima said farewell, leaving for the Canary Islands. Many employees of Sartori & Berger attended the cruise ship during their calls in Hamburg as agent, also in charge of ground- and luggage handling. After the stormy weekend Hamburg appears at its best on Monday morning. At sunrise against a blue sky the team of Sartori & Berger is ready i.a. to receive the luggage of the departing guests of the luxury liner Queen Mary 2. Just before weekend NKT Victoria passed the Holtenau locks. 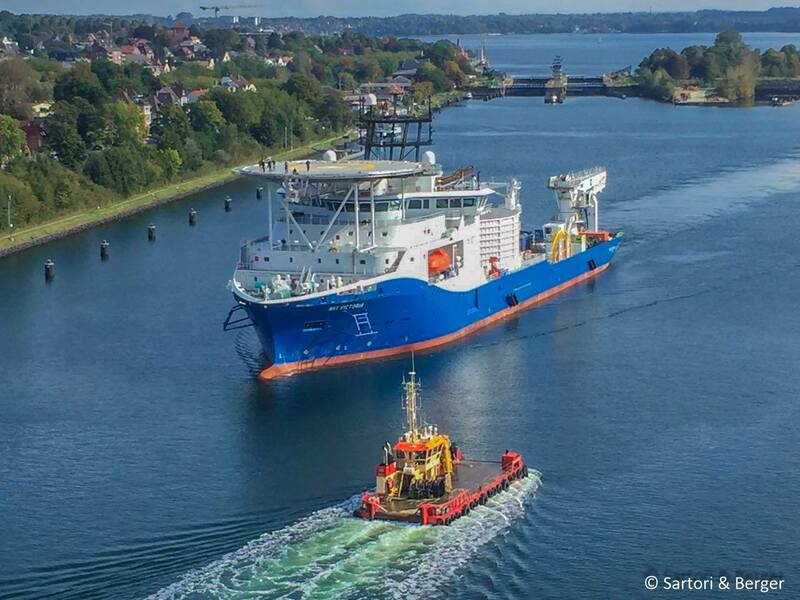 The view of the cable ship offered a fascinating variation for the employees of Sartori & Berger, who were in charge of the clearance.